Just a few days are left for IBPS RRB Mains It is time to pace up your preparation of Banking Awareness for IBPS RRB PO and Clerk Mains. 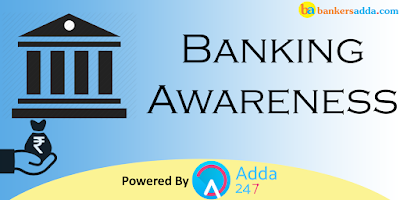 These questions related to Banking Awareness will also help you in preparing for other upcoming banking recruitment examination. Sol. According to the Income Tax Act of 1961, the age of Super senior Citizens is 80 years. Sol. A dividend is a payment made by a corporation to its shareholders, usually as a distribution of profits. When a corporation earns a profit or surplus, it can re-invest it in the business (called retained earnings) and pay a fraction of the profit as a dividend to shareholders. Q3. Which of the following economic concepts is categorised on the basis of Current Account or Capital Account or both? Sol. Budgetary deficit is the difference between all receipts and expenses in both revenue and capital account of the government.If revenue expenses of the government exceed revenue receipts, it results in revenue account deficit. Similarly, if the capital disbursements of the government exceed capital receipts, it leads to capital account deficit. Budgetary deficit is usually expressed as a percentage of GDP. Q5. Sukanya Samriddhi Account can be opened up to age of ________ years only from the date of birth. Sol. Sukanya Samriddhi Account can be opened up to age of 10 years only from the date of birth. Q6. Which Bank has launched instant credit cards enabling its savings account customers to get a credit card instantly, in a completely digital and paperless manner recently? Sol. The country's largest private sector lender, ICICI Bank has launched instant credit cards enabling its savings account customers to get a credit card instantly, in a completely digital and paperless manner. Q7. Private sector lender IDFC Bank has partnered with digital payments company Zeta, to launch ‘IDFC Bank Benefits’. It is a payment solution for corporates that digitizes employee spends and claims, making the process simple, real-time and paperless. Where is the head office of IDFC Bank? Sol. Private sector lender IDFC Bank has partnered with digital payments company Zeta, to launch ‘IDFC Bank Benefits’. It is a payment solution for corporates that digitizes employee spends and claims, making the process simple, real-time and paperless. The Head office of IDFC Bank is in Mumbai. Q8. Syndicate Bank has pared its marginal cost of funds based lending rate (MCLR) by 5-10 basis points in certain maturity buckets recently. Where is the headquarter of Syndicate Bank? Sol. Syndicate Bank has pared its marginal cost of funds based lending rate (MCLR) by 5-10 basis points in certain maturity buckets. MCLR for six months and one year will be 8.3 percent (8.35 percent now) and 8.5 percent (8.60 percent now), respectively, with effect from August 10. Headquarter of Syndicate Bank is in Manipal, Karnataka. Q9. India signed a loan agreement with Asian Infrastructure Investment Bank (AIIB) for the financing of USD 329 million for Gujarat Rural Roads Project. AIIB based in-? Sol. India signed a loan agreement with Asian Infrastructure Investment Bank (AIIB) for the financing of USD 329 million for Gujarat Rural Roads Project. Headquarters of AIIB is located in Beijing, China. Sol. Private sector lender Axis Bank reduced the interest rate on savings bank accounts by 50 basis points to 3.5 percent for deposits up to Rs 50 lakh. However, the bank will continue to pay 4 percent interest on deposits of above Rs 50 lakh. Sol. Senior Citizen Saving Scheme (SCSS) is exclusively meant for people over the age of 60 years. They shall come into force on the 02nd day of August in 2004. Q12. What is the maturity period of Senior Citizen Saving Scheme (SCSS)? Sol. The maturity period of Senior Citizen Saving Scheme (SCSS) is 5 years. Q13. There are only four eligible categories of PSLCs i.e. PSLC General, PSLC Small and Marginal Farmer, PSLC Agriculture & PSLC Micro Enterprises. PSLC stands for-? Sol. There are only four eligible categories of PSLCs i.e. PSLC General, PSLC Small and Marginal Farmer, PSLC Agriculture & PSLC Micro Enterprises. PSLC stands for Priority Sector Lending Certificates. Sol. All PSLCs will be valid till March 31st and will expire on April 1st. Q15. The guidelines specify that MCLR calculated using methodology prescribed shall correspond to the tenor of funds in the single largest maturity bucket provided it is more than 30% of the entire funds reckoned for determining the MCLR. What is the meaning of "M" in MCLR? Sol. The guidelines specify that MCLR calculated using methodology prescribed shall correspond to the tenor of funds in the single largest maturity bucket provided it is more than 30% of the entire funds reckoned for determining the MCLR. MCLR stands for Marginal Cost of Funds based Lending Rate. IBPS RRB Admit Card 2017 - Download Now!